Do you ever get a craving for something you once ate in the past that you can’t quite put your tongue on? I have that problem with Italian – I’m always chasing this one sauce I lost years ago. I ordered it from one of the very first proper Italian restaurants I ever went to and was blown away. At the time I didn’t think to note down the name of the dish or restaurant, because in my youthful hubris I assumed I’d always remember. I did end up always remembering the dish, but not the actual name or where it came from. I crave it often but I’ve accepted that it’s likely I’ll never find it again and even if I do, it could never be as good as I’ve built it up in my memories. But! I haven’t come to terms with it, because the prospect of finding it again seems tantalizingly likely. It was just a standard clear or brown probably beef (but definitely not ground beef) Italian meat sauce. How hard can it be to track down and recreate all the usual pastas that would be served in a restaurant in the mid 2000s? So, whenever I’m making pasta at home, I always go for a new recipe, hopeful that I might accidentally stumble upon the sauce of my dreams. The other day I volunteered to cook dinner for Steph — something I’m always wishing I could do more of — and of course researched my sauce options on the internet for a new and likely candidate. 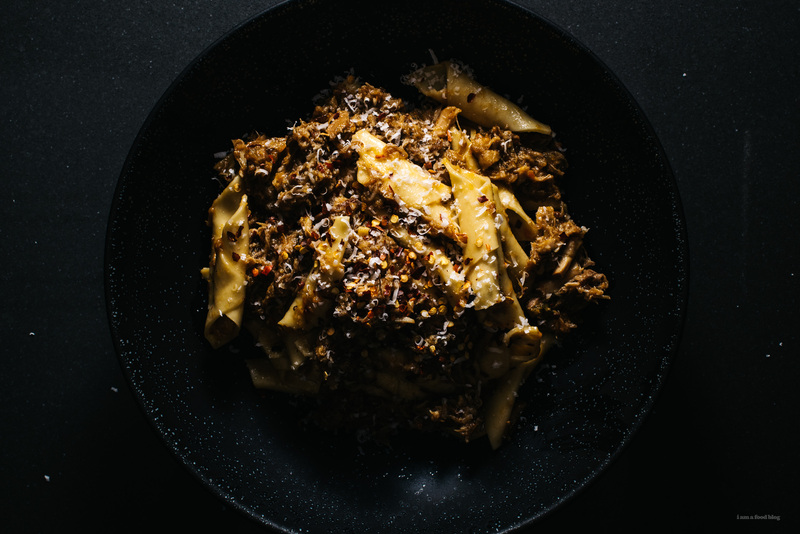 I found an amazing sounding pork sugo recipe from Delfina in SF – a restaurant that neither of us had never been to. Nevertheless, I held hope that it could finally be the sauce. And the recipe sounded great. Steph and I have totally different tastes in recipes. She prefers the simple, pared down classics that represent long years of perfection and ratios. For me, the crazier sounding a recipe is, the more I want to make it. This one needed two different cuts of pork, an overnight rest, and a blender. I was in. It came together easily, with almost no prep work and the majority of its time in the oven and smelled better and better with each hour. It drove me nuts with anticipation – could this be it? It drove Steph nuts too, because there was no food in sight that day. I placated her with some pho from our favorite Vietnamese joint, partially to escape the wonderful smells coming from our oven. The next day Steph made some perfect (because everything she does is perfect in my eyes) handmade garganelli. We sauced it and sat down to take our hugely anticipated first bites. It. was. amazing. It had a depth of flavor that comes from an easy oven braise and an amazing texture from the blender. I would rate it, purely personally, as one of my top 10 sauces I’ve ever made. Was it the one though? Not even close, but I think my fairy saucemother was on duty; this one might be better. Cut down the pork shoulder into smaller chunks and season both pork shoulder and ribs with salt and pepper. Heat the canola oil on medium high in a moderately deep, heavy bottomed pan that you own a cover for and brown meat well on all sides. Remove the meat from the pan and reduce heat to medium low. Add onions, carrots, celery, garlic, rosemary, and sage and cook until onions are transparent. Add tomato paste and cook for two more minutes, then add wine. Scrape up any bits stuck to the bottom of the pan and continue cooking until the wine has reduced by half. Return the meat to the pan and add stock. Make sure the meat is submerged in the stock. Transfer the pan to the oven and put the cover on. 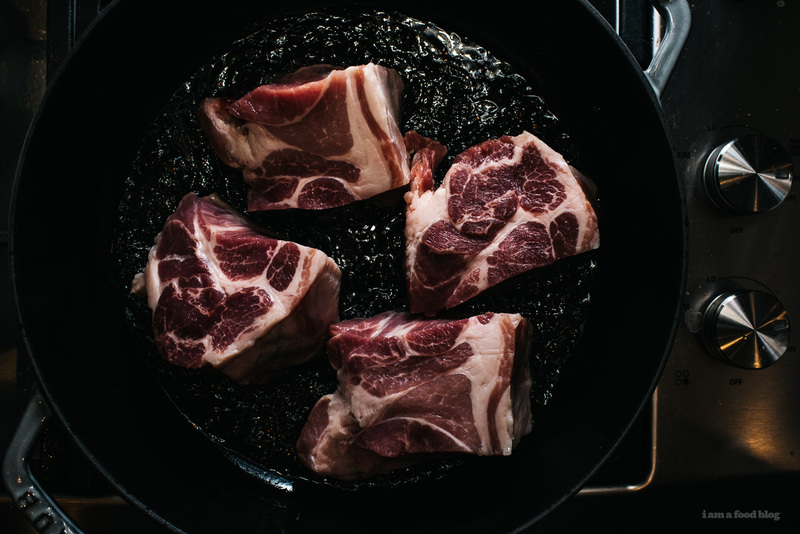 After 2 hours, remove the pan from the oven and transfer the meat to a sealed container or bowl with plastic wrap. 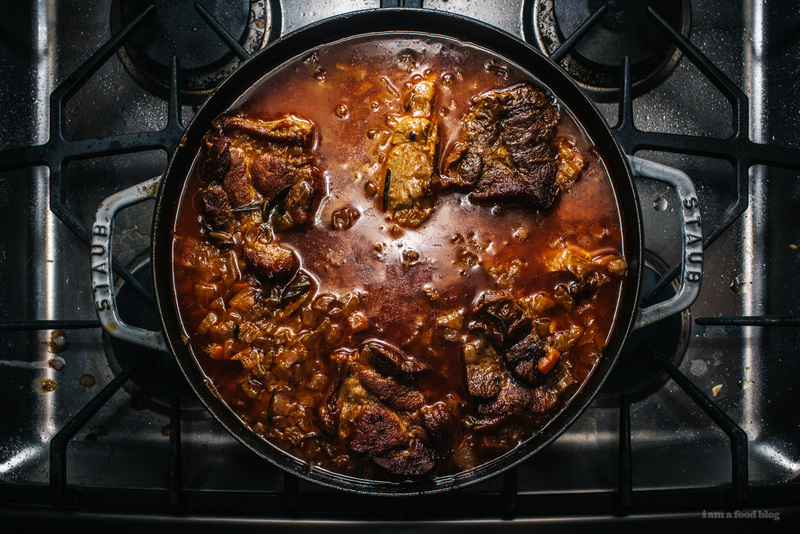 Allow both meat and sauce to cool, and refrigerate overnight. The next morning, discard as much of the congealed fat as desired. Warm the sauce through and puree in a blender. Return the sauce to the stove and reduce until it has good body, about half. Meanwhile, shred the meat with a fork or by hand. Once the sauce has reduced, adjust seasoning, then add the meat back to the sauce and bring to a boil, then remove from heat. To serve: Warm an appropriate amount of sauce in a wide saute pan. 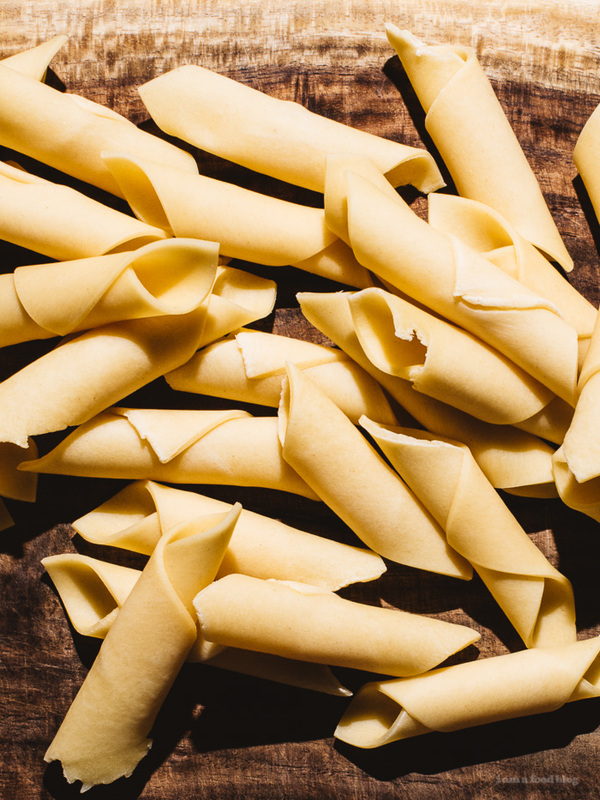 Cook your favorite pasta until 2 minutes before al dente. Scoop out about a cup of the pasta water and reserve, then drain the pasta and transfer to the saute pan. Add a small knob of butter plus parsley to the pan, then cook on medium high for 2 minutes. Add some of the reserved pasta water if needed. Serve with parmesan and chili flakes if desired. Note: If I did this again, I’d get another cut of pork instead of shoulder, probably pork belly, and skip the browning step entirely. That looks intense! The only ingredient that stands out as different is the white wine. The overnight rest does wonderful things for complex sauces like this! Also, bumps up the convenient factor when making the next day. Turns out I had the pasta name wrong, that’s what I get for writing at 3am. It was garganelli, fixed now, thanks! 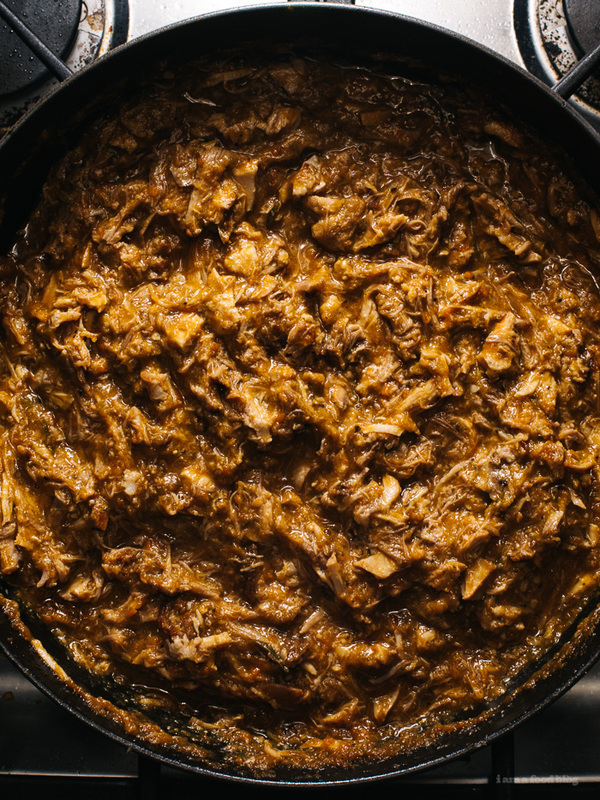 As someone who has be craving some amazing slow cooked pork… this looks to die for. And man those overnight rests really work wonders on breaking down the tissues and infusing flavors! WHOA, so delicious looking! This looks amazing! 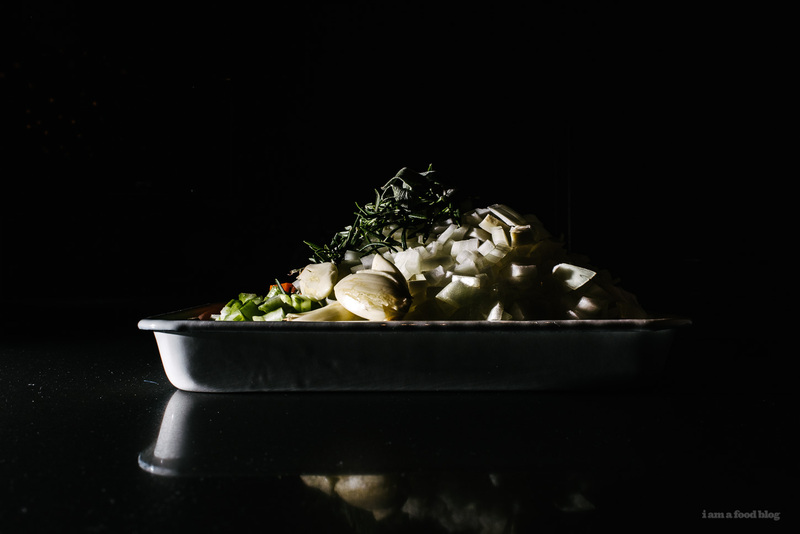 I love the shot in the Staub pan especially…I really like the direction your photos have taken. 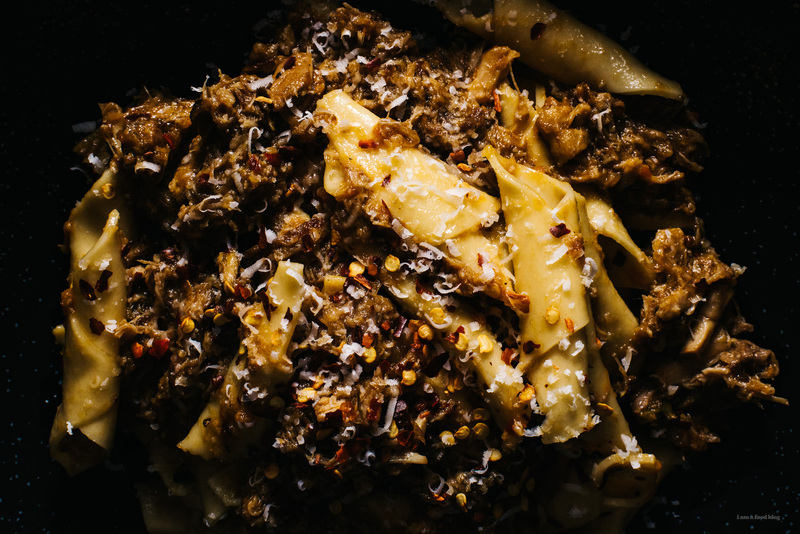 The homemade pasta looks so rustic and perfect at the same time. Love this! You’ve completely sold me. I definitely want to make this. I’m with you, the crazier sounding the recipe, the more I want to make it. Although, sometimes you can’t be a classic. Good thing we don’t have to choose. I grew up eating Delfina pasta! It’s an essential restaurant in SF, that you’ve got to try if you’re ever in town. Thanks for writing up the recipe; excited to make it soon. I found your blog a couple of weeks ago and simply fell in love ‘hard’ with the site. (lol) The site is bold, in your face and irresistible and more importantly unique. You stand out in sea of sand. 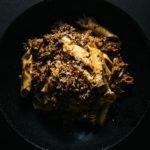 I am a newbie food blogger and found your site through Saveur. Your Porchetta recipe and Pork Sugo really jumped out at me. Can you tell that I love pork. I promise to come back and let you know when I try one of these recipes. In the meantime, continued success. Finally made it. I altered a few things, smoked the pork shoulder (rubbed over night in 8-3-1-1 based on your receipe herbs) separately, chopped and added in before the overnight soak, added about 2oz fresh parm, a dried shitake microplaned, doubled the tomato paste and used about half the stock. Rediculous umami. Noice one. A serious keeper—thanks! Why would you skip the browning step? In this case, I think the benefits of a softer, silkier texture on the meat outweighs the mailliard goodness that comes from browning, plus it shaves off 20 minutes and a lot of splatter.